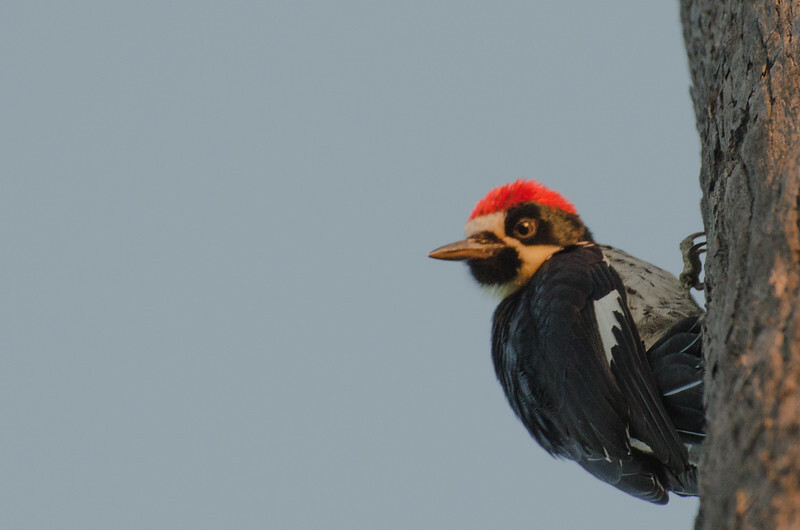 Steve & His Camera: Acorn woodpeckers -- Woody Woodpecker? Just screwing around with the telephoto lens before sunset -- nice light on the palms on my street and the woodpeckers were doing their usual late-in-the-day flyabout. Didn't get a true keeper; focus is a little fuzzy on these because they were handheld. Tripod next time although that will be difficult -- these guys don't stay in one place for long. The black and white is probably the more interesting one. Both were taken with my Nikon D5100 using the Nikon 70-300mm telephoto lens. Top photo settings: 300mm, ISO 800, 1/400, f/8, manual, heavily cropped. Bottom photo settings: 300mm, ISO 640, 1/800, f/5/6, manual, lightly cropped. Converted to b&w in Lightroom 4. Also Topaz denoise to help get rid of excess noise. I always assumed Woody Woodpecker was modeled on an acorn woodpecker, given their abundance in Southern California. According to the Oracle (i.e. Wikipedia), it was either a pileated woodpecker or acorn woodpecker with pileated having the edge.